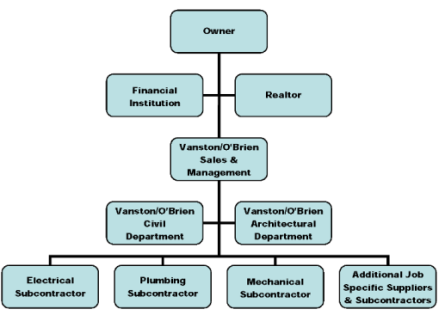 Although Vanston/O'Brien works well in any method of project delivery, we encourage the use of design/build because we strongly believe in the advantages for our clients. Design/build contracting is an integrated approach that occurs when a single entity is responsible for both the design and the construction services. Owners, designers, contractors, and subcontractors work together as a team with the intention of offering a faster and less expensive way to complete the project than the more conventional design-bid-build method, while still providing high quality and functionality. Each discipline contributes to the building design as a whole, rather than focusing on only their portion of the project. This collaboration creates early knowledge of construction costs, and allows for informed decision making during the design phase and increased production during construction. Utilizing our affiliated companies and in-house trades, we can steamline the construction process and achieve Value through Partnership to offer our clients tremendous savings in both cost and time.